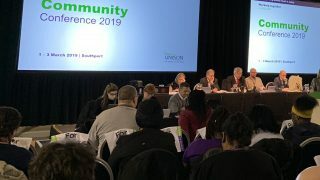 On the final morning of UNISON’s Black member’s conference, delegates opened with an emotional debate on the tragic toll of knife crime and how to combat the problem. Paulette Whyte for the national Black members’ committee reported that police had recorded over 39,000 knife offences for the year to the end of June 2018 – a rise of 12%. “This cannot carry on,” she said, before quoting Martin Hewitt, an assistant commissioner at the Metropolitan Police in London saying that: “not enough preventative work has been done”. 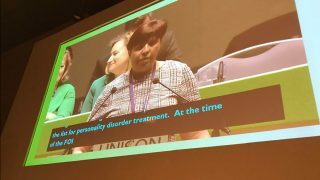 Citing cuts to youth services – “there are too many areas where there are no youth clubs, no community centres for our young people” – she also told delegates how she had discussed the issue with her 26-year-old son, who noted that social media is one of the problems, with young people increasingly believing that they could simply take anything they wanted, even violently. Ms Whyte urged delegates to tell councils that “youth services aren’t luxuries but essentials”. She quoted one gang member saying: “There’s nothing else for us to do … I don’t even know what this war is about any more”. And the delegate pointed out that “knives destroy not just one, but two sets of lives – victim and perpetrator. Both sets of families suffer”. Another delegate, a lecturer in a college and first aider who has actually had to save the life of a stab victim, explained how her college organised a seminar on knife crime. “We need to educate; we need to parent,” she added. Otherwise, if “we wait for government, we’re going to spend more [money] on funerals”. Simone Coy from Lambeth talked of dealing with young Black men in trouble and some who been affected by gang violence. One was “just riding his bicycle, doing delivery work.” Near home, some boys approached and asked what area he came from. When he responded that he was just on the way home, they stabbed him. Fortunately, he survived. She urged members working in communities to share more information among themselves. 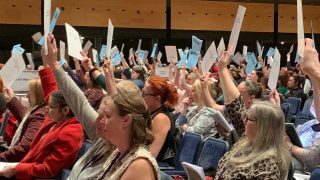 Jackie Moore from Luton, a “youth worker for 33 years”, talked of “postcode wars”, where they are holding meetings in schools, churches and in any building they can. 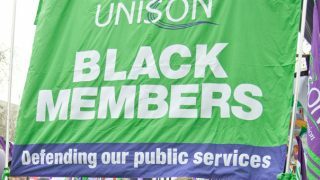 • The morning also saw motions on the impact of poor housing on Black families and a series of debates on Black people and mental health. The first of these focussed on Black women and mental health. A speaker for the national women’s committee highlighted how poverty and poor housing add to depression. But stereotypes are also part of the problem. Culturally, there is a view that: “mental health problems are for weak people; mental health problems are for white people – this hinders us. 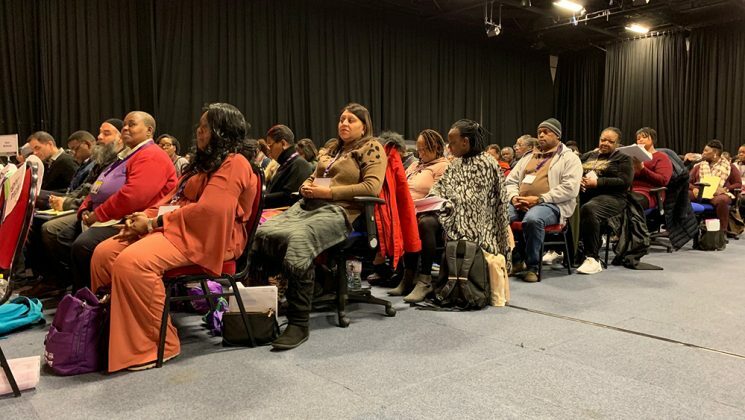 “The strong Black woman stereotype can harm us,” she told delegates, even as research shows that Black women are at high risk of having mental health problems. Hazel from Northern region noted how it was “so sad” that mental health continued to carry a stigma. “It’s okay to not be okay,” she concluded. And Rodney Williams from Eastern region told conference that “many Black men fell short, because of fear,” in not supporting Black women when they called out for help. “If we Black men chose to support this motion, will we do it with integrity?” he asked. “Will we do our part to make the changes, so that all Black women feel safe to aspire?” he asked, to wide applause.